Like us, dogs need all the food groups: water, protein, carbohydrates, fats, minerals, vitamins and fibre. But the quantities and ratios they need are quite different to ours. What’s more, every stage of a dog’s life needs a different nutritional balance. Even size and shape should be taken into account. There’s a lot to consider, and it can be hard for a puppy to thrive on home-prepared food. Water is vital to your puppy’s metabolism - in fact, their body is around 70% water. As you’ll know, they lose a lot of that each day and need to replace it regularly, so a water bowl is essential. Water is better for your puppy than cow’s milk, which can give many puppies diarrhoea. Protein is muscle food and while grains, rice and potatoes contain a fair amount, meat is the most concentrated source of protein and the easiest way to build your puppy’s fast-growing physique. Fat is good for energy and helps the absorption of vitamins. Plus it also helps to keep skin and coats healthy. But too much fat means your puppy has to consume more food to get the other nutrients they need – a recipe for obesity. Carbohydrates are a vital energy source. In the wild, a dog might get them from fruit and vegetables. In dog food, they come from pre-cooked rice, grain and pasta. 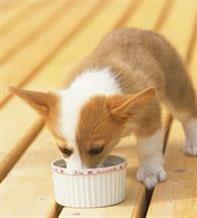 Your highly active puppy needs more than twice the amount of calories per mouthful than a full-grown dog. Minerals enable your puppy to grow. All puppies need calcium and phosphorus for bones and muscle, and iron for red blood cells. But calcium-rich foods often contain a dangerous amount of phosphorus. It’s really important to provide exactly the right balance of nutrients for your puppy. Vitamins are essential for a healthy metabolism. Vitamin A is important for sight, vitamin B for nerves, and vitamin D for bones. While vitamin E protects the skin and vitamin K supports blood coagulation. But unlike us, dogs can’t metabolise vitamin C.
Fibre is all the vegetable matter that doesn’t get digested, but which keeps your dog regular (and easy to pick up after!). A shortage of dietary fibre leads to constipation – not pleasant for you or your puppy.